The PayPal Payflow Pro Payment Gateway allows you to create a PayPal payment gateway, integrated directly within your site (rather than through the PayPal website, as is the case with the PayPal Payment Gateway). In order to use the PayPal Payflow Pro Payment Gateway, you will need an Internet Merchant Account with an acquiring financial institution. The PayPal Payflow Pro Payment Gateway currently supports credit and debit card payment processing only. Once you have added a PayPal Payflow Pro Payment Gateway, you can configure its settings on its associated asset screens. The majority of these screens are the same or similar to those for a Standard Page and are described in the Asset Screens manual. In this chapter, we will describe the Details and Display Formatting screens, which are different for a PayPal Payflow Pro Payment Gateway. The Details screen allows you to configure the settings of the PayPal Payflow Pro Payment Gateway. For more information about the Status, Future Status, Thumbnail and Details sections, refer to the Details Screen chapter in the Assets Screens manual. The fields that are available in this section are described below. The information required for these fields can be obtained when created and configuring your Payflow account. For more information, refer to the PayPal Payflow Payment Gateway website. Merchant ID: enter the merchant login ID of your Payflow account. 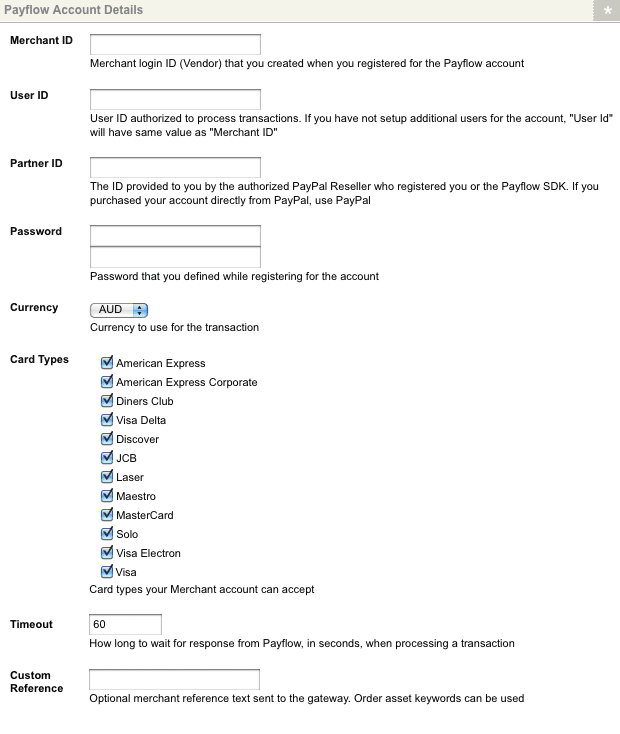 User ID: enter the user ID that is authorised to process transactions on the PayPal Payflow Pro Payment Gateway. If you have not set up additional users on your Payflow account, this User ID will be the same as the Merchant ID. Partner ID: enter the ID provided to you by the authorised PayPal reseller who you registered your Payflow account with. If you purchased your account directly from PayPal, use the value PayPal in this field. Password: enter the password of your Payflow account. Card Types: select the card types that will be available on the PayPal Payflow Pro Payment Gateway. If a card type is not selected, users will not be able to select that card type during the transaction process. By default, all card types are selected. Timeout: select the amount of time in seconds that the payment gateway will wait for the user's response before returning an error. By default, this field is set 60 seconds. Custom Reference: this field allows you to send a custom merchant reference on the payflow transaction. You can use both regular and global keyword replacements in this field, for example, to send information on the current e-commerce order (e.g. to send the order ID). This section allows you to use the Card Verification Value (CV2) and Address Verification (AVS) systems as added security for credit and debit card transactions made on the PayPal Payflow Pro Payment Gateway. Enable CV2: select whether or not to enable Card Verification Value checks for transactions made on the PayPal Payflow Pro Payment Gateway. If this field is set to Yes, the CV2 field should be included on the payment gateway using keyword replacements. For more information, refer to the Display Formatting Screen section in this chapter. Enable AVS: select whether or not to enable Address Verification System checks for transactions made on the PayPal Payflow Pro Payment Gateway. If this field is set to Yes, pass through variables should be configured to source the address from the user's e-commerce form responses. For more information, refer to the Pass through Variables section below. This section allows you to modify the payment gateway to function in Test Mode. The Test Mode section of the Details screen is shown in the figure below. In the Enable Test Mode field, select whether or not to use the payment gateway for testing purposes only. If this field is set to Yes, the payment gateway will not process any payments and the Card Number field on the PayPal Payflow Pro Payment Gateway form will be replaced with the test drop down menu, as shown in the figure below. This section allows you to source address information for the Address Verification Service (AVS) from the user's e-commerce form responses. For example, a user's response to a Postcode question on an e-commerce form could be passed through to the PayPal Payflow Pro Payment Gateway to provide the postcode for the AVS. The Pass through Variables section of the Details screen is shown in the figure below. The Display Format Bodycopy is used to define the layout of the PayPal Payflow Pro Payment Gateway page. The default layout of the payment gateway is shown in the figure below. Tip: By default, the transaction amount on the PayPal Payflow Pro Payment Gateway will be listed in dollars. This may need to be changed depending on the currency you have selected on the Details screen. Card Expiry Month (Text Box): this will show the credit card expiry month text box field. Card Expiry Month (Dropdown Box): this will show the credit card expiry month drop-down box field. Card Expiry Year (Text Box): this will show the credit card expiry year text box field. 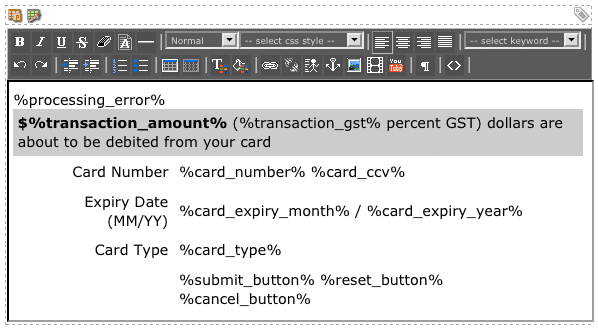 Card Expiry Year (Text Box): this will show the credit card expiry year drop-down box field. Card Holder's First Name: this will show the card holder first name field. Card Holder's Last Name: this will show the card holder last name field. Billing Address Street (Street Number, Name and Type): this will show the street field of the billing address. Billing Address City: this will show the city field of the billing address. 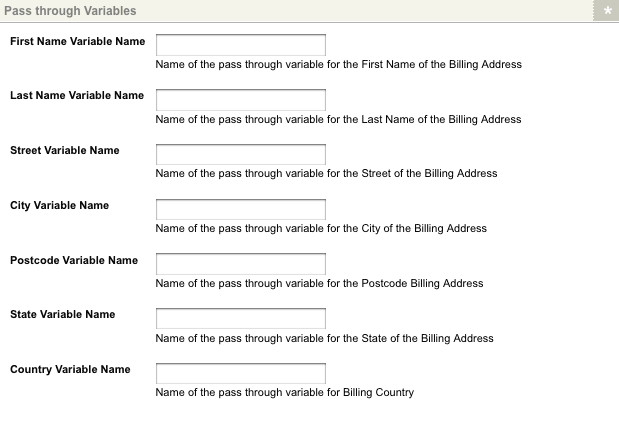 Billing Address State: this will show the state field of the billing address. Billing Address Postcode: this will show the postcode field of the billing address. Billing Address Country: this will show the country field of the billing address.